In 1987, Mary LaMeres-Pomin and Lyle Martin left the “traditional” world of home real estate in search of a better way for consumers to sell their homes. They developed a model that provides home sellers with all of the services they need from a real estate company, but for a low, flat fee. The Assist-2-Sell® discount cost model also appealed to home buyers, who recognized the benefit of the large selection of competitively-priced homes offered through Assist-2-Sell’s exclusive home listings database. The response to this consumer-friendly model was immediate and significant. Since opening the first office in Reno, Nev., Assist-2-Sell has grown to hundreds of offices in both the U.S. and Canada. Over the years, Assist-2-Sell has been recognized by numerous publications as one of the fastest growing and most successful real estate franchises, a testament to the efficacy of the low-fee real estate service model. Assist-2-Sell’s popular “low fee” concept attracts a high volume of business. While the low-fee commission results in significant discounts for the home sellers, continuing to deliver full-service is the key to the company’s success. Consumers want and need the full services of a professional REALTOR®; they just don’t want to the pay high commissions associated with these services. With Assist-2-Sell’s full real estate services and discounted commission rate, those needs are fulfilled. Assist-2-Sell has saved home sellers over $1 billion in real estate commissions, and is the leading discount home real estate company in North America. In 2004, Don Marton P.A., and Tom Carroll P.A. were awarded an Assist-2-Sell franchise here in South Florida. We provide home real estate services to Broward and Palm Beach counties, including the Parkland, Coconut Creek, Boca Raton, and Coral Springs communities. Both Don and Tom are active members of the local REALTOR Association and former top-producing Coldwell Banker agents who have been recognized for many outstanding sales achievements. To work with our real estate team, contact our Assist-2-Sell office today! The information herein is deemed to be accurate, but not guaranteed. All information to be verified. Savings based on national statistics since 01/01/00 for all Assist-2-Sell offices in North America compared to paying a 6% commission. Highly recommended! Not only did they sell my mom's house, but they helped her find a fantastic new home! Their dedication, patience, and kindness make them better than all others! Tom and Don at Assist-to-Sell were fabulous to work with! Very responsive to any question or concern that we had. We had an offer on our home within 48 hours and sold our home for top dollar!!!! I would highly recommend them to anyone. Assist2Sell sold our condo quickly and we saved thousands by NOT paying the overpriced Traditional Commission Fees. Flat Fee Savings is the way to go! The team Tom Carroll and Don Marton are very professional. The listing was presented very well with professional photos and a drone video. If buying or selling from my experience I would recommend them it was a smooth process from listing to closing. You can trust them to represent your needs. Susan R.
Tom and Don were a great team to assist us in the sale of our home. The photo/video highlighted all the best parts of our home! They answered all our questions and gave us all the information up front that we would need to know plus kept us updated throughout the entire process. Closing went smoothly as well. We loved working with both Tom and Don at Assist 2 Sell. They listened to our needs and made sure we got the best deal possible for our home. They were professional and incredibly helpful. I mostly appreciated how available they were at any time to answer any questions or address any concerns we had throughout the process of selling our home. We will definitely give them a call again when we are ready to purchase our next home. After our listing expired with a traditional, full commission, agent we decided to drop our price and go with a discount agent. After a long search and many interviews we went with Assist-To-Sell after speaking with Tom Carroll. This became the turning point in the sale of our home. Tom, Don and Maureen really came through for us! Not only did we see more traffic, but the number and size of the offers went up as well. We sold our home in a reasonable period of time for a reasonable amount and that’s all you can ask of an agent. These guys are five stars all the way! They are very knowledgeable, professional and hard working. Tom went above and beyond to step in for us when we traveled. His pictures were very great, as good as and sometimes better than the professional photographer used by our first agent. 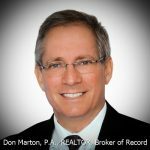 Don Marton was extremely helpful during the closing and even provided me with insights after our sale and during the purchase of our new home. I consider myself to be pretty savvy on financial issues and a bit of a know-it-all on everything else, but Don was spot-on with his advice and counsel. We hired then as a company to sell our home but now they are friends. We would strongly recommend this team to anyone selling a home in South Florida. The professional photos/video created by Tom resulted in a quick sale. Saving money on the commission was a great perk but more important was the excellent service received. From the initial meeting thru closing Tom was always available and very quick to respond to questions. Tom provided helpful advice and made the selling process easy. We recommend Assist-2-Sell to everyone interested in buying/selling. 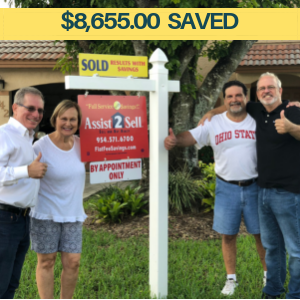 * * * * * Assist2Sell sold our condo quickly and we saved thousands by NOT paying the overpriced Traditional Commission Fees. Flat Fee Savings is the way to go! The team Tom Carroll and Don Marton are very professional. The listing was presented very well with professional photos and a drone video. If buying or selling from my experience I would recommend them it was a smooth process from listing to closing. You can trust them to represent your needs. Susan R.
Great experience, saved thousands of dollars and even received a cut of the commission on the purchase of my new home. Will never use a traditional realtor again! We closely worked with Tom and Don to sell our home in Boca, in July 2018. They were both professional, always quick to respond to our calls or texts, and could not have asked for a better team to work with! Both Tom & Don are knowledgeable and professional. They answer their phones in a timely manner and gave us great advise throughout the process of selling our house. We would hire them again because they saved us $8650. THANKS GUYS! Tom and Don were amazing! We got a full price offer on the first day! They saved us money, made an amazing slideshow,advised us how to proceed after inspection and appraisal, and walked us through the whole process! Easy peasy! Thanks guys for a job well done! It is one more thing checked off of our long list! 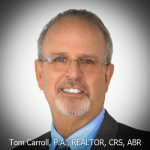 We hired Tom Carroll and his partner Don Marton after interviewing a number of realtor teams. Tom’s local knowledge of the Parkland marketplace and years of experience gave us the confidence this was the right choice. Their no haggle fixed price would also save us thousands. Don Marton came as a complete bonus. The sale of our home was complicated and Don’s wealth of experience dealing with a change in lenders, the buyer’s inexperienced realtor team and working in collaboration with the attorney was a huge plus. We could not be happier with the team of Tom and Don and highly recommend them to represent you in one of the biggest financial decisions you make. Tom and Don were amazing to work with! They sold my townhouse in 1 day and got us over 97% of the asking price. They were able to save us over $5,000 in commission savings! I would highly recommend them for the sale and purchase of your home! We contacted Don regarding a property for which he was the listing agent. He was extremely responsive and forthcoming about the status of the property and existing offers. We negotiated terms and email response time was typically within minutes. Based on his professionalism, we had Tom and Don represent us as the buyer and we couldn't have been happier. He made himself available for multiple appraisals and inspections at the property, trips to the HOA managing agent or anything else we needed. He is extremely knowledgeable regarding the nuances of Florida real estate transactions and was on top of every detail. As a result the transaction went extremely smooth for all parties. We highly recommend Don and Tomand will use them again. Tom and don where great to deal with. And easy to talk to. I would highly recommend this company. Tom an Don were a great team! They were easy to work with, professional, and on top of that, nice people! My house was on contract the week it was on the market, and everything else including closing went smoothly. Choose Assist-2-Sell for great services and great savings! Tom and Don were great to work with! Excellent customer service with care and integrity...and big savings $$$$ too. Thanks so much for everything Tom and Don!! Highly recommended for all your selling and buying needs!! !